Recently retired David Haye believes that Anthony Joshua’s upcoming fight against Alexander Povetkin could provide him with a sterner test than his breakthrough victory over long-time champion Wladimir Klitschko. The undefeated Englishman will defend his WBA, WBO and IBF titles against the Russian veteran at Wembley Stadium in London on September 22. 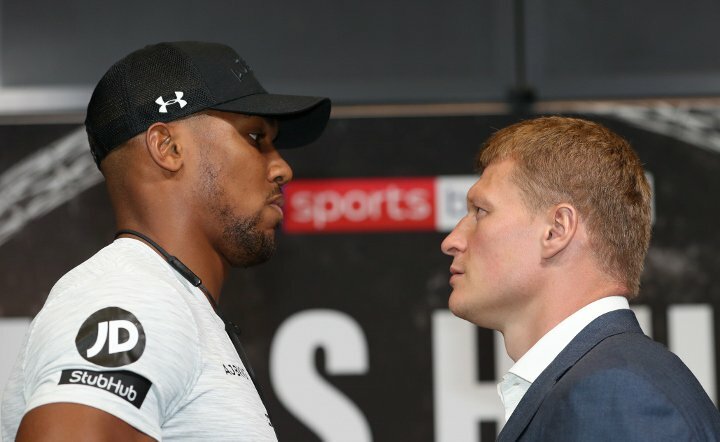 “I believe Povetkin is the toughest opponent Joshua has ever had and that includes his fights with Klitschko, [Dillian] Whyte and [Joseph] Parker,” said Haye in an interview with SunSport. The 39-year-old Povetkin 34-1 (24) and the 28-year-old Joshua 21-0 (20) have a common opponent in Klitschko. Povetkin was knocked down three times en route to a wide unanimous decision loss to Klitschko in a world title bout five years ago. Joshua famously defeated the long-reigning champion by TKO11 in a competitive fight in April last year. “His [Povetkin] only loss was on points to Klitschko, and that was when Klitschko, was in his prime,” continued Haye. “The Klitschko that fought Joshua, in my opinion, was not as good as the Klitschko that beat Povetkin.